Charles Babbage was born on December 26, 1791. His father, Benjamin, was a wealthy merchant and banker. The Babbages lived in Walworth, Surrey, just outside London, and Charles was the first of four children, although two brothers died in infancy. When Charles became seriously ill in 1799, his parents took him to Devon for the healthier country air. Charles began school in Devon. His subjects included mathematics for simple navigation and accounting. This was the beginning of the interest that was to shape his career. Incorrect calculations in navigation often caused shipwrecks. Charles devoted much of his working life to developing machines that would accurately calculate and print mathematical and astronomical tables so that errors could be eliminated. When Charles recovered from his illness, he returned to London. He attended school at Enfield, and his mathematical ability became obvious. In 1803, the family moved permanently to Devon. Charles attended Totnes Grammar School until 1810, then entered Trinity College at Cambridge University. He was so keen to study mathematics that he spent his spare time poring over mathematics books, including some written in French. When he sought help from his lecturers, he was amazed to find they were ignorant of the latest developments in mathematics in France. There was rivalry between England and France because of the Napoleonic wars, and fear that an uprising like the French Revolution may take place in England. Consequently, it was considered unpatriotic to study French mathematicians and scientists such as Blaise Pascal. Similarly, British mathematicians had turned their back on developments in Germany. This rejection of ideas from Europe held back the development of mathematics in England. It also meant that those like Babbage who studied the advances being made in Europe were labelled unpatriotic liberals, and encountered opposition from narrow-minded colleagues. In 1812, Babbage and two friends formed the Analytical Society at Cambridge. These friends were the outstanding astronomer John Herschel (who like Babbage was a devout Christian) and mathematician George Peacock. Eventually, the Analytical Society played a very influential role in reforming mathematics in English universities. Babbage obtained his degree in mathematics in 1814. In the same year, he married Georgina Whitmore. They had about eight children, but only five lived beyond infancy. Georgina died in 1827. Just after his marriage, Babbage decided to become a minister. He applied for several vacancies in the Church. Unfortunately, the Church leaders took too much notice of Babbage’s unjustified reputation as an unpatriotic liberal, and his applications were rejected. The Church’s loss was mathematics’ gain. Charles and Georgina moved to London in 1815. Here he demonstrated his practical ability in mathematics and gave several lectures on the advantages of experimentation in addition to theory in mathematics. As a result of this work, in 1816 he was elected a member of the Royal Society— the prestigious association of British scientists. He obtained his Master’s degree in 1817. Babbage’s revolutionary calculating machine, which he called a ‘difference engine’. He demonstrated the small version of this machine to the Royal Society, and gained their immediate support. During the next few years, Babbage made important contributions in areas of pure mathematics such as algebra and the theory of functions. With encouragement from mathematicians, navigators and scientists, he began work on an analytical machine. In the early 1820s, he began constructing a calculating machine with a capacity for 20 decimal places. He began by making a smaller, six-wheel calculating machine which performed calculations accurately, and demonstrated this to the Royal Society, who gave him their enthusiastic support. As a result, the government agreed to contribute financially to the continued development of his ‘difference engine’. 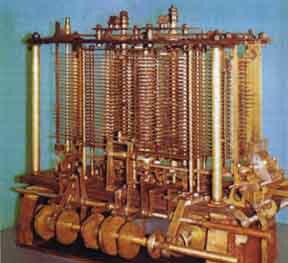 Babbage designed the difference engine to automatically calculate and print mathematical tables, thus removing human error. He produced logarithm tables in 1827 using the smaller engine. Although Babbage was professor of mathematics at Cambridge University from 1826 until 1835, he was rarely required to lecture. This enabled him to devote most of his time to research. However, construction of the larger engine was expensive. Government funds were insufficient and were slowed down by ‘red tape’. Babbage initially had little money, but when his father died in 1827 he became quite wealthy. Addition of his own funds helped the project to continue. He continued improving the difference engine into the 1830s. He then conceived the ‘analytical engine’. Up to 1,000 numbers with 50 digits in each number would be stored. Unfortunately, Babbage didn’t construct a working model of his analytical engine. He continued to have financial problems because of the cost involved in designing and manufacturing new machinery. The greatest problem was the inability at that time to produce components with sufficient accuracy and flexibility. This technological failure left Babbage deeply disappointed. ‘Babbage was attempting the impossible with the means at his disposal. The concept and the principles behind the Analytical Engine, on the other hand, were absolutely sound.’1 This became evident when Babbage’s unpublished notebooks were discovered in 1937. His design was re-examined. With the technology of the 1940s, the modern computer became a reality. Not only did Babbage conceive the forerunner of today’s computer hardware (the machinery), but he also conceived the necessity for a program (which is how today’s computer software functions). Babbage’s conception of how programs would be written closely resembles the techniques used in modern computer programming. Babbage became a founding member of the British Association for the Advancement of Science in 1831, and helped found the Royal Astronomical Society. He also had been instrumental in founding the Statistical Society in 1834. He compiled the first reliable actuarial tables—that is, the ‘risk’ tables used by insurance companies, and he helped establish the modern postal system in England. Babbage was a prolific inventor. He invented the speedometer, the cowcatcher used on the front of locomotives, and an early ophthalmoscope—the instrument used by doctors to see inside your eye. He also invented hundreds of tools and mechanical devices for use in factories. Some of his other inventions had applications in mining, architecture and bridge construction. Babbage’s inventions and his research techniques played a significant role in the development of Britain’s industrial technology in an era when Britain was emerging as the industrial leader of the world. In a biography by his friend, H.W. Buxton, Babbage is depicted as a man of integrity.2 Despite the frustration of being unable to convince others of the need to maintain the momentum of Britain’s industrial and scientific advances, Babbage never maligned those who failed to support him. Babbage will be remembered as the father of modern computing, but he should also be remembered as a committed Christian. Ed. note: Unfortunately, Babbage, like John Herschel mentioned above, was what we would now call an old-earth compromiser. After the rise of old-age beliefs thanks to James Hutton and Charles Lyell, some scientists caved in and ‘re-interpreted’ the Bible to fit them. For example, some claimed that the days in Genesis 1 were really ages, and that Noah’s Flood was one of many catastrophes. For proof that such ‘re-interpretations’ are fallacious, see Creation Compromises and Noah’s Flood Covered the Whole Earth. 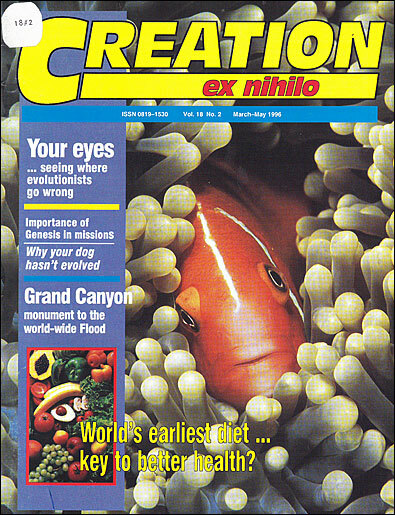 A. Feldman and P. Ford, Scientists and Inventors, Bloomsbury, London, 1989, p. 125. H.W. Buxton in a biography of Babbage held in the Museum for the History of Science, Oxford, UK. Cited in: A. Hyman (Ref. 3 below), p. 251. A. Hyman, Charles Babbage: Pioneer of the Computer, Oxford University Press, Oxford, p. 14. H.W. Buxton, Memoir of the Life and Labours of the Late Charles Babbage Esq., unpublished, p. 1986. Cited in: J.M. Dubbey, The Mathematical Work of Charles Babbage, Cambridge University Press, Cambridge, 1978, p. 227. Hyman (Ref. 3), p. 253.